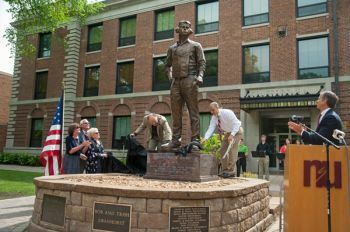 Friends, family and dignitaries gathered on the Northern State University campus in Aberdeen June 14 to dedicate a statue of Cresbard native Cecil Harris, the U.S. Navy's second-highest scoring ace during World War II. In our May/June issue, we wrote about young Aberdeen sculptor Ben Victor’s latest project: a 9-foot bronze of Cresbard native and World War II naval flying ace Cecil Harris. More than 200 people gathered on the Northern State University campus in Aberdeen over the weekend to officially dedicate the statue outside Spafford Hall. Harris had gone largely unrecognized for his heroics until friends and family began spreading his story in recent years. In 2010, an 80-mile stretch of South Dakota Highway 20 through Potter and Faulk counties was designated as the Cecil Harris Memorial Highway. There has also been a push to have the Congressional Medal of Honor awarded to Harris posthumously, but when it appeared unlikely to happen, efforts turned to raising funds for the statue. Harris was born in Cresbard in 1914. He was a student at Northern when he joined the Navy before the Japanese attack on Pearl Harbor in December 1941. His most memorable mission came on Oct. 12, 1944, when he shot down four enemy aircraft and saved two of his Fighting Squadron 18 teammates at Formosa. His heroics earned him the Silver Star. On two more occasions he shot down four enemy planes without taking a bullet. By Nov. 25 he had accumulated a total of 24 and a new nickname: Speedball. By the end of the war, Harris was the second highest Navy scoring ace. He received numerous honors in his long military career, including the Navy Cross, Silver Star, Distinguished Flying Cross and the Air Medal. Harris returned to Cresbard after the war and lived quietly as a teacher and high school principal. He returned to active duty during the Korean War and became a career Navy officer, serving 27 years before retiring in 1967. He died in 1981 in Washington, D.C., and is buried at Arlington National Cemetery. Some wonder if Harris would welcome the attention. There’s a story that says when Harris came home from World War II, a large crowd gathered at the train station in Cresbard to greet him. The train pulled in and left again with no sign of Harris. Apparently he had sneaked out the other side and went to the local pool hall for a beer. Nevertheless, Ben Victor’s statue seems a fitting tribute to a World War II hero that few South Dakotans know anything about.